Don't Wait Until Its Too Late. Find out Now! Can you prevent disease with Vitamin D? Vitamin D deficiency: Will you know when it's too late? The ZRT Laboratory now offers a simple, convenient and accurate test for screening Vitamin D levels. California State health law does not allow the testing of specimens collected or mailed from California without a written order from a health care professional licensed to prescribe in California (M.D. ; N.D.; D.C.; D.O. ; N.P. ; and L.Ac.). Maryland and New York State health law prohibits ZRT Laboratory from processing Internet orders for New York State residents at this time. Many physicians are responding to recent research linking a variety of disease states and general wellness to Vitamin D levels. Vitamin D deficiency (levels measured below 32 ng/ml) does not have obvious symptoms and can increase your risk for more serious diseases including flu, cardiovascular disease, osteoporosis and multiple sclerosis. In addition, an increased risk for strokes, diabetes (types 1 and 2), depression, and breast and colon cancer are closely linked to low Vitamin D levels. This is simply not something to play around with. The saying "an once of prevention is better than a pound of cure" is a true statement in regard to Vitamin D testing. It only makes sense that a Vitamin D deficiency is linked to so many health problems because we are designed to literally soak it up for free from the sun, but ironically even though it is free, we spend so much time indoors that we just don't get enough. This is why Vitamin D supplementation becomes crucial. ZRT has developed and refined Vitamin D testing (both D2 and D3) in dried blood spots. A few drops of blood from a quick and nearly painless nick of the finger are placed on a filter paper to dry. This can be performed easily either at a health practitioner's office or the convenience of your home. The dried blood spot sample is then sent to ZRT for analysis. With ZRT's innovative blood spot test, there is no more wasted time and resources going to a lab for a painful blood draw. 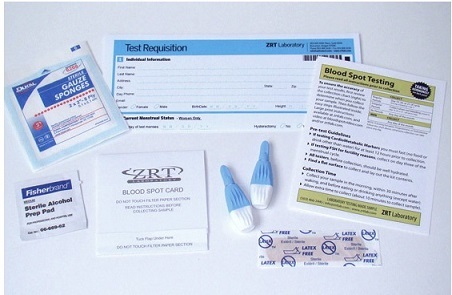 Once ZRT has received your dried blood spot sample, your results will be available in about a week. As you continue to monitor your Vitamin D levels, ZRT will generate a "history" test report with your newest test results compared with previous tests. This will enable your health care provider to recommend the right dose of supplementation, if necessary, and then track your treatment progress. If you have additional questions about Vitamin D or blood spot testing, please ask your doctor, pharmacist, or other trained health care provider. Learn more about ZRT's Accuracy in testing Vitamin D or Order a test here. This test cannot be shipped to residents of New York or MD. California customers will need a doctor's prescription.